The 2017 Photography award winners and Ohio State Fair participants were Alex King and Courtney Dodds. Clare Sollars and Marissa Sheets were recognized as five-year camp counselors. Susanna Eckstein and Cole Karnes were recognized as four-year camp counselors. 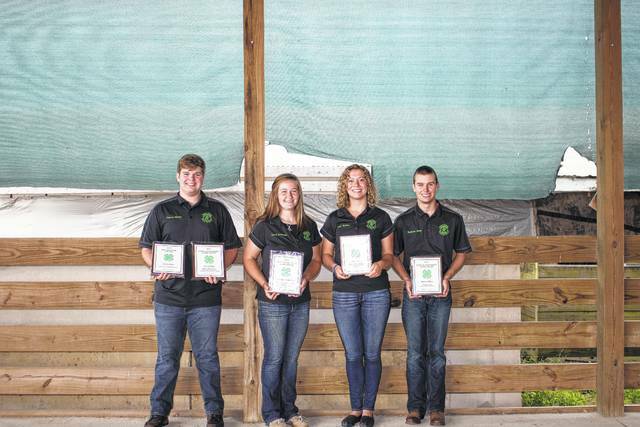 The 2017 Self-Determined award winners and Ohio State Fair participants were Abigail Joseph, Christina Luebbe, Sarah Warner Bailey Miller and Trevor Minyo. 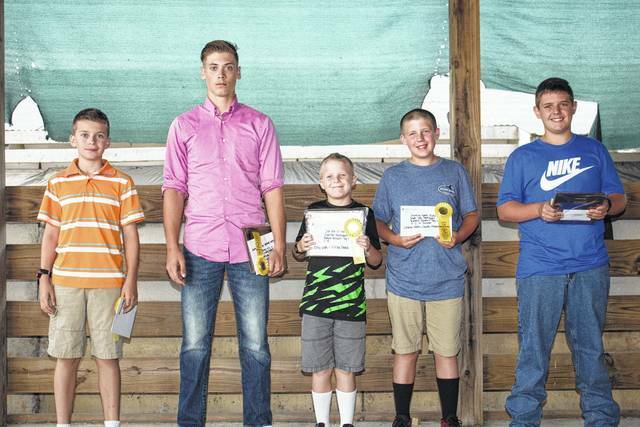 Winners from the Tractor Rodeo held on June 14 were Austin Bodeker, Paul Lambert, Logan Foy, Weston Pettit, Jacob Sears and Victoria Schappacher. The Fayette County Extension Office recently awarded exhibitors for completing their various projects. Not all winners are pictured. The 2017 Special Interest award winners and Ohio State Fair participants were Sarah Warner, Mcale Callahan, Summer Hurles, Jennifer Richards, Trevor Minyo, Titus Lehr, Claudia Fuller, Kylie Pettit, Jonathon Mead, Trinity Johns, Jordan Bernard, Deanna Page, Paighten Reed, Sydney Carter, Adelyn Hoppes, Madalyne Frye, Bernadette Dowdell, Isabella Dowdell, Laura Robinson, Jenna Goddard, Nehemiah Lehr, and Matthew Warner. The 2017 Dogs, Pets and Veterinary Science award winners and Ohio State Fair participants were Hannah Bageant, Hailey Honicker, Brittany Martindale, Lilly Hamilton, Aleecia Taylor, Macy Miller, Courtney Dodds, Katrina Koski, Emily Haines and Summer Hurles. The 2017 Health & Safety Public Speaking Contest, held on May 4, winners were Trevor Minyo, Jenna Goddard, Kelsey Pettit and Lilly Hamilton. 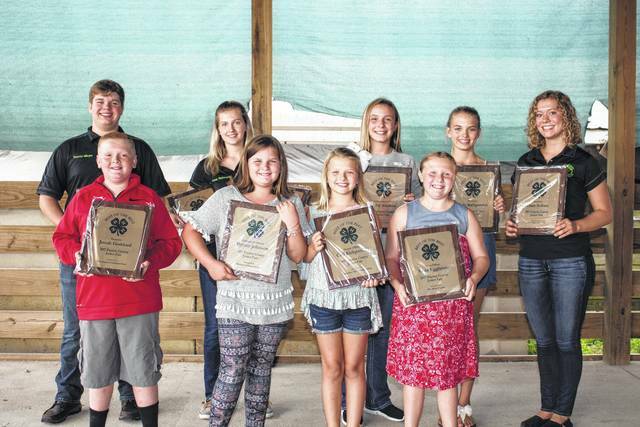 The 2017 Conservation award winners and Ohio State Fair participants were Emma Eggleton, Cassandra Koski, James McGuire, Anita Pursell and Annabelle Eggleton. The 2017 Best Welding project winner and Ohio State Fair participant was Matthew Warner. The 2017 Electricity/Engineering award winners and Ohio State Fair participants were Darrin Boyle, Jacob Manbevers, Kyler Batson, Emily Haines and Lauren Joseph. The 2017 Fayette County 4-H Club Outstanding Officer award winners were Macy Gerber, Abigail Noble, Colin Farrens, Todd Ford, Therese Robinson, Drew Black, Lucas King, Jenna Goddard, Mcale Callahan, Taylor Perkins, Michael Schappacher, Emma Eggleton, Lorelei King, Caleb Foy, Andrea Robinson, Victoria Schappacher, Haylee Anders, Laura Robinson, Bridget Rodriguez, Caleb Bennett, Susanna Eckstein, Madison Johnson and Bryce Bennett. 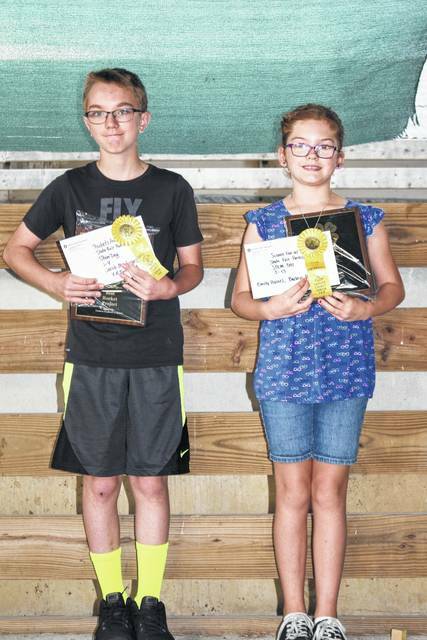 The 2017 Woodworking award winners and Ohio State Fair participants were Perry Peppy, Todd Ford and Cheyenne Williams. Several others were recognized as three-year camp counselors: Jordan Bernard, Macy Detty, Khenadi Grubb, Elizabeth Kratzer, Spencer Minyo, Abbi Pettit, Lena Steele and Tori Evans. 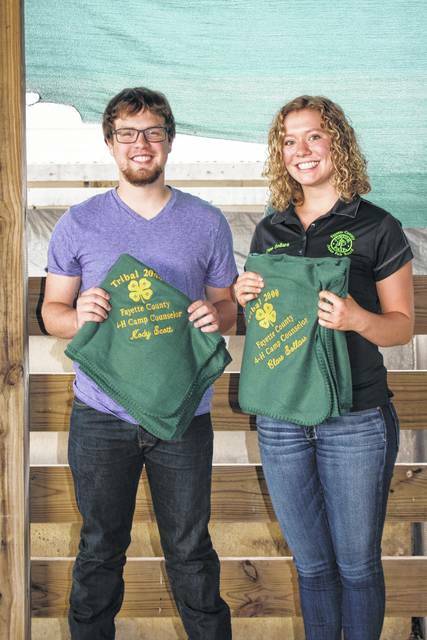 Clare Sollars and Kody Scott were also recognized with a special green “Tribal 2000” blanket after they received the highest number of votes for best leadership during 4-H Camp. The 2017 State 4-H Achievement award winners were Todd Peterson, Trevor Minyo, Victoria Schappacher, Clare Sollars, Spencer Minyo, Tori Evans, Khenadi Grubb, Abbi Pettit, Andrea Robinson and Quinton Waits. The 2017 Shooting Sports award winners and Ohio State Fair participants were Devon Carter, Levi Morrison, Justin Shoemaker, Billy Wolfe, Kyler Batson, Charlie Wolfe, Luke Hoppes, Derek Mitchem, Benjamin Speakman and Jacob Brown. 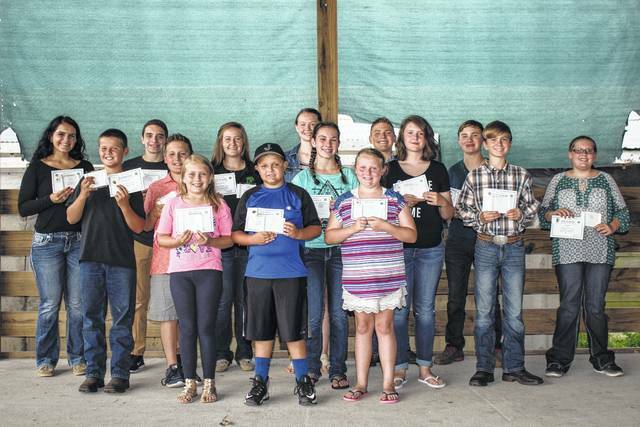 The 2017 Best of the Best 4-H Officers were Anna Robinson, Peyton Johnson, Elizabeth Aleshire, Cali Kirkpatrick, Anna Eggleton, Trevor Minyo, Jonah Goddard, Hidy Kirkpatrick, Anna Robinson and Clare Sollars. 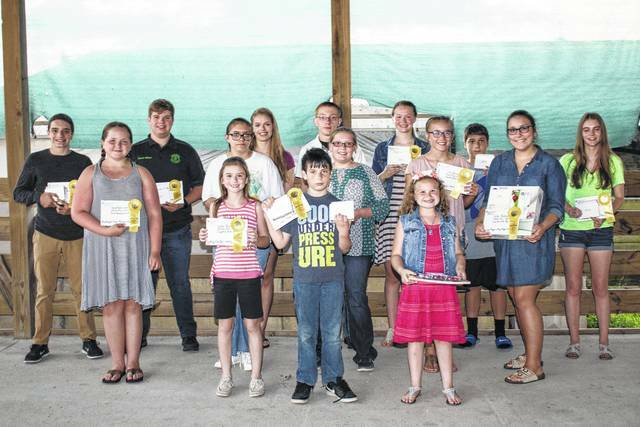 The 2017 Nutrition Project award winners and Ohio State Fair participants were Cali Kirkpatrick, Emily Haines, Ethan Steele, Jonah Goddard, Emily Turner, Regan Hagler, Gracelyn Zimmerman, Clare Sollars, Trevor Minyo and Claudia Fuller. 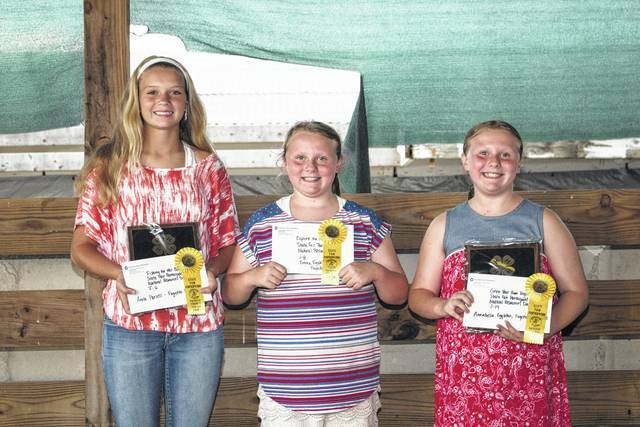 The 2017 Self-Determined award winners and Ohio State Fair participants were Abigail Joseph, Christina Luebbe, Sarah Warner Bailey Miller and Trevor Minyo. Winners from the Tractor Rodeo held on June 14 were Austin Bodeker, Paul Lambert, Logan Foy, Weston Pettit, Jacob Sears and Victoria Schappacher. https://www.recordherald.com/wp-content/uploads/sites/27/2017/07/web1_IMG_7210.jpgThe 2017 Photography award winners and Ohio State Fair participants were Alex King and Courtney Dodds. 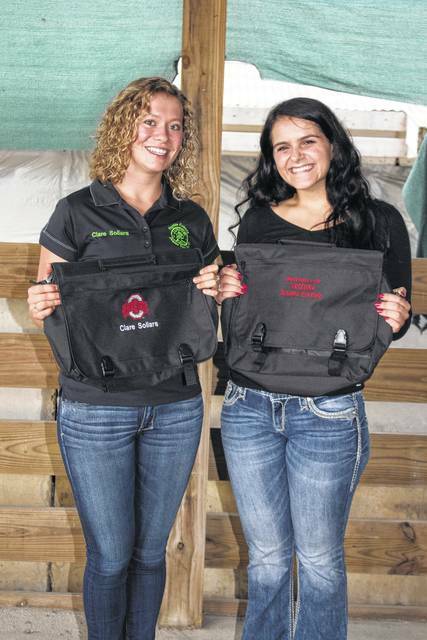 https://www.recordherald.com/wp-content/uploads/sites/27/2017/07/web1_IMG_7234.jpgClare Sollars and Marissa Sheets were recognized as five-year camp counselors. Susanna Eckstein and Cole Karnes were recognized as four-year camp counselors. 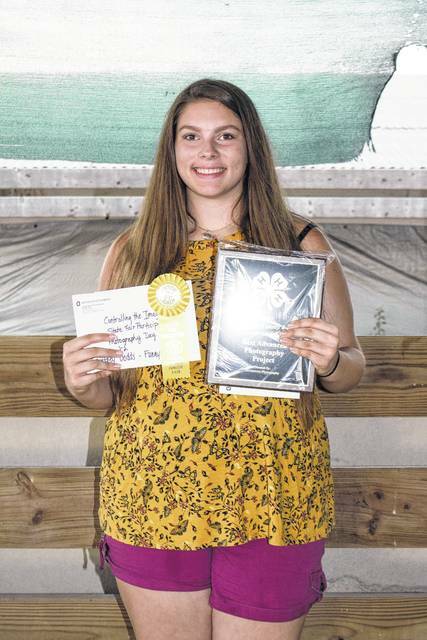 https://www.recordherald.com/wp-content/uploads/sites/27/2017/07/web1_IMG_7229.jpgThe 2017 Self-Determined award winners and Ohio State Fair participants were Abigail Joseph, Christina Luebbe, Sarah Warner Bailey Miller and Trevor Minyo. 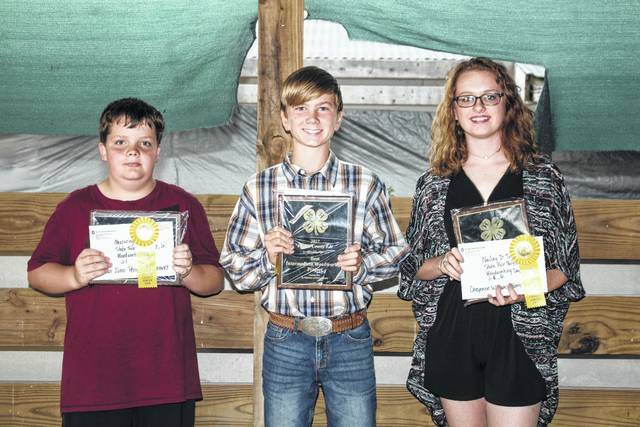 Winners from the Tractor Rodeo held on June 14 were Austin Bodeker, Paul Lambert, Logan Foy, Weston Pettit, Jacob Sears and Victoria Schappacher. https://www.recordherald.com/wp-content/uploads/sites/27/2017/07/web1_IMG_7205.jpgThe Fayette County Extension Office recently awarded exhibitors for completing their various projects. Not all winners are pictured. The 2017 Special Interest award winners and Ohio State Fair participants were Sarah Warner, Mcale Callahan, Summer Hurles, Jennifer Richards, Trevor Minyo, Titus Lehr, Claudia Fuller, Kylie Pettit, Jonathon Mead, Trinity Johns, Jordan Bernard, Deanna Page, Paighten Reed, Sydney Carter, Adelyn Hoppes, Madalyne Frye, Bernadette Dowdell, Isabella Dowdell, Laura Robinson, Jenna Goddard, Nehemiah Lehr, and Matthew Warner. https://www.recordherald.com/wp-content/uploads/sites/27/2017/07/web1_IMG_7208.jpgThe 2017 Dogs, Pets and Veterinary Science award winners and Ohio State Fair participants were Hannah Bageant, Hailey Honicker, Brittany Martindale, Lilly Hamilton, Aleecia Taylor, Macy Miller, Courtney Dodds, Katrina Koski, Emily Haines and Summer Hurles. https://www.recordherald.com/wp-content/uploads/sites/27/2017/07/web1_IMG_7231.jpgThe 2017 Health & Safety Public Speaking Contest, held on May 4, winners were Trevor Minyo, Jenna Goddard, Kelsey Pettit and Lilly Hamilton. 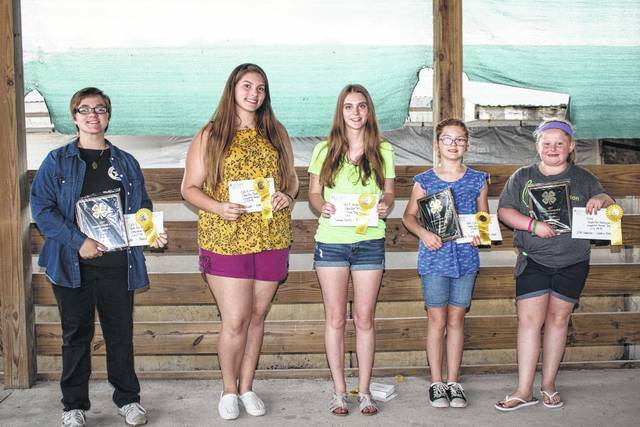 https://www.recordherald.com/wp-content/uploads/sites/27/2017/07/web1_IMG_7223.jpgThe 2017 Conservation award winners and Ohio State Fair participants were Emma Eggleton, Cassandra Koski, James McGuire, Anita Pursell and Annabelle Eggleton. 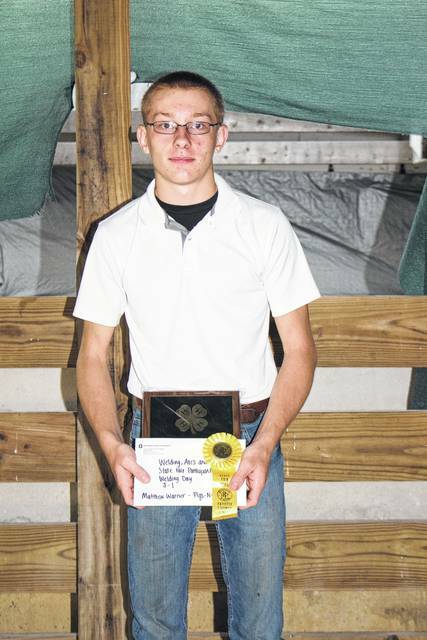 https://www.recordherald.com/wp-content/uploads/sites/27/2017/07/web1_IMG_7213.jpgThe 2017 Best Welding project winner and Ohio State Fair participant was Matthew Warner. https://www.recordherald.com/wp-content/uploads/sites/27/2017/07/web1_IMG_7219.jpgThe 2017 Electricity/Engineering award winners and Ohio State Fair participants were Darrin Boyle, Jacob Manbevers, Kyler Batson, Emily Haines and Lauren Joseph. 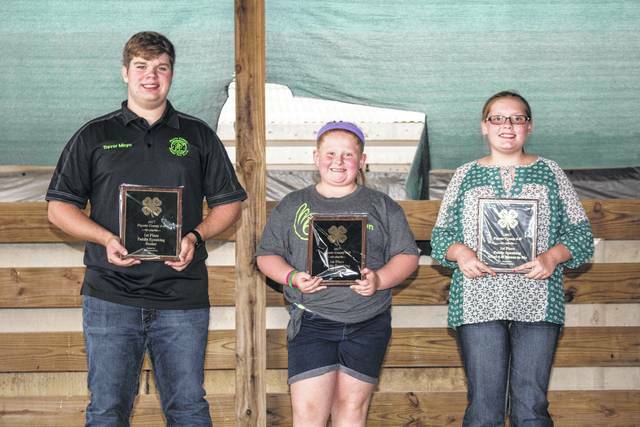 https://www.recordherald.com/wp-content/uploads/sites/27/2017/07/web1_IMG_7247.jpgThe 2017 Fayette County 4-H Club Outstanding Officer award winners were Macy Gerber, Abigail Noble, Colin Farrens, Todd Ford, Therese Robinson, Drew Black, Lucas King, Jenna Goddard, Mcale Callahan, Taylor Perkins, Michael Schappacher, Emma Eggleton, Lorelei King, Caleb Foy, Andrea Robinson, Victoria Schappacher, Haylee Anders, Laura Robinson, Bridget Rodriguez, Caleb Bennett, Susanna Eckstein, Madison Johnson and Bryce Bennett. 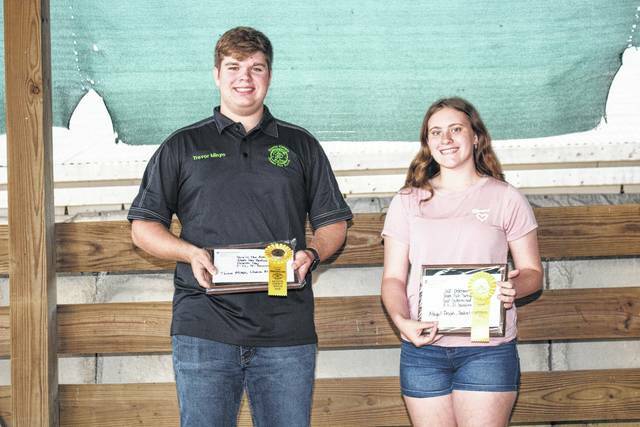 https://www.recordherald.com/wp-content/uploads/sites/27/2017/07/web1_IMG_7212.jpgThe 2017 Woodworking award winners and Ohio State Fair participants were Perry Peppy, Todd Ford and Cheyenne Williams. https://www.recordherald.com/wp-content/uploads/sites/27/2017/07/web1_IMG_7236.jpgSeveral others were recognized as three-year camp counselors: Jordan Bernard, Macy Detty, Khenadi Grubb, Elizabeth Kratzer, Spencer Minyo, Abbi Pettit, Lena Steele and Tori Evans. 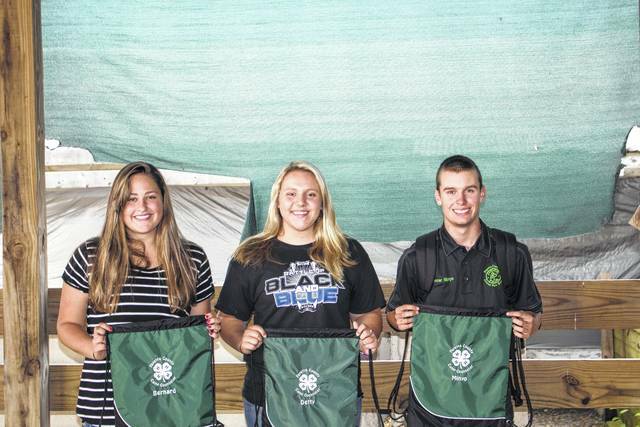 https://www.recordherald.com/wp-content/uploads/sites/27/2017/07/web1_IMG_7239.jpgClare Sollars and Kody Scott were also recognized with a special green “Tribal 2000” blanket after they received the highest number of votes for best leadership during 4-H Camp. https://www.recordherald.com/wp-content/uploads/sites/27/2017/07/web1_IMG_7244.jpgThe 2017 State 4-H Achievement award winners were Todd Peterson, Trevor Minyo, Victoria Schappacher, Clare Sollars, Spencer Minyo, Tori Evans, Khenadi Grubb, Abbi Pettit, Andrea Robinson and Quinton Waits. https://www.recordherald.com/wp-content/uploads/sites/27/2017/07/web1_IMG_7227.jpgThe 2017 Shooting Sports award winners and Ohio State Fair participants were Devon Carter, Levi Morrison, Justin Shoemaker, Billy Wolfe, Kyler Batson, Charlie Wolfe, Luke Hoppes, Derek Mitchem, Benjamin Speakman and Jacob Brown. 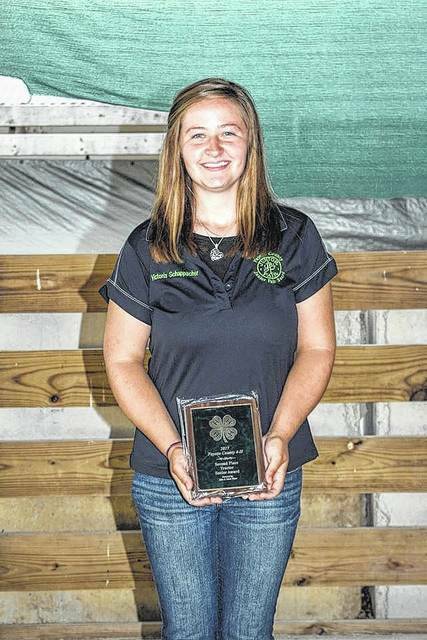 https://www.recordherald.com/wp-content/uploads/sites/27/2017/07/web1_IMG_7255.jpgThe 2017 Best of the Best 4-H Officers were Anna Robinson, Peyton Johnson, Elizabeth Aleshire, Cali Kirkpatrick, Anna Eggleton, Trevor Minyo, Jonah Goddard, Hidy Kirkpatrick, Anna Robinson and Clare Sollars. 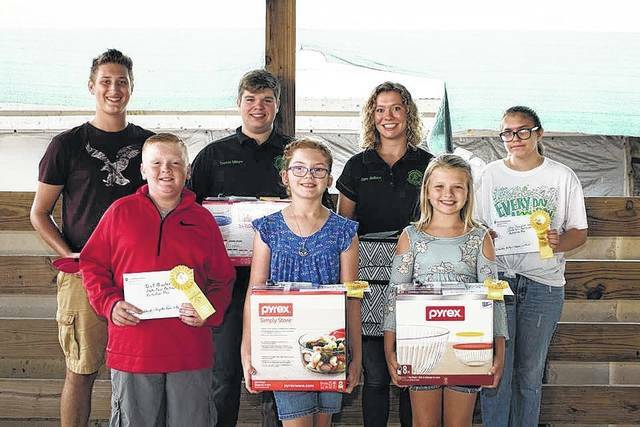 https://www.recordherald.com/wp-content/uploads/sites/27/2017/07/web1_AwardsRoundUpSpecialInterest.jpgThe 2017 Nutrition Project award winners and Ohio State Fair participants were Cali Kirkpatrick, Emily Haines, Ethan Steele, Jonah Goddard, Emily Turner, Regan Hagler, Gracelyn Zimmerman, Clare Sollars, Trevor Minyo and Claudia Fuller.